I'm realizing that the rhythm of life in this small Japanese town of Nihonmatsu is quite a lot slower than I'm accustomed to. I seem to be permanently hardwired to a high speed pace: go, go, go – at all times! It's that or I am the most impatient person in the world…. or I have the attention span of a three year old…. or probably all of the above. I seem to have something inside of me that needs to keep pushing forward at all times. Call it drive or ambition, I don't know, all I can say is that for me I need to make every second count: there is so much to do and experience in life, you know? 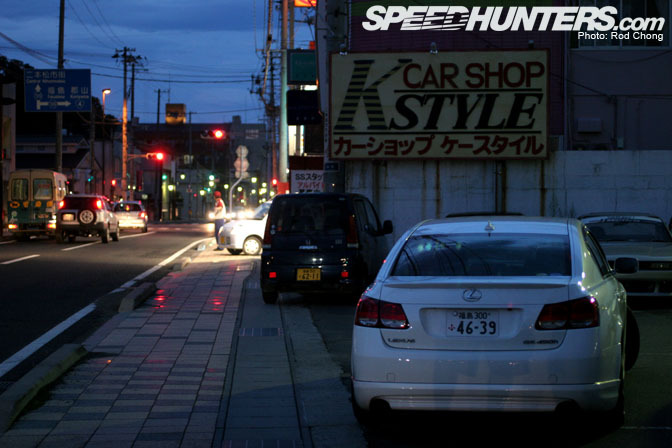 Anyway, last night we received our summons to meet our Japanese host, Kumakubo-san, at K Style, his tuning shop. Almost every night since we've been here the Team Orange family of guests, mechanics, wives, children and drivers tend to gather at the end of the day at K Style. Usually there is an hour or so of sitting about as the last of the group strolls in. Plenty of chatter, laughter and smoking ensues. Then suddenly, we will be ushered off to a restaurant of our host's choosing. So far this pattern has repeated itself almost every night since we've been in the Ebisu circuit area. Now I'm not a particularly social person at the best of times. I'm happiest working away behind a computer, camera or engaged in intense one-on-one discussions. Classic introvert. Normally during these extended relaxed social periods I'll bring a laptop or my crackberry along so I can keep working, either on blog posts for Speedhunters or on the other top secret projects we are developing at Need for Speed central. I have to constantly pinch myself on the daily visits to K Style that this is indeed not a dream. For me, its just amazing to be able to get up close and personal with some of the world's most famous professional drifting cars. On the right we have Kumakubo's current Evo9 Drift car, which is currently without an engine, having chewed up its internals at the last D1GP round. 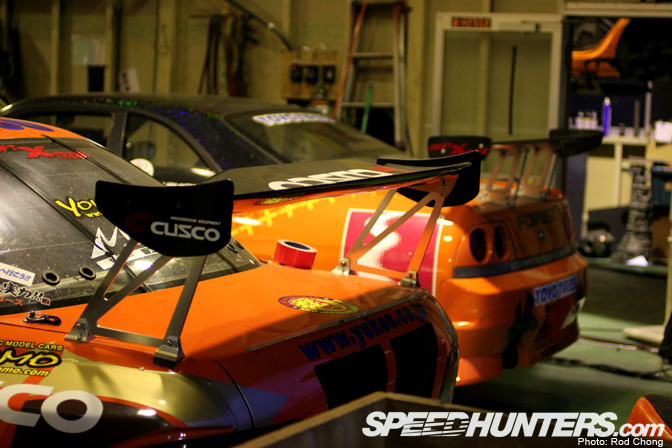 On the left is something special: it's the new Team Orange EvoX drift car shell taking form. 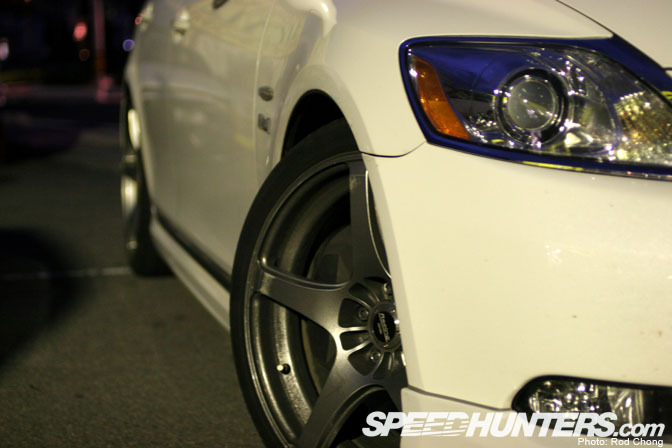 Sitting at one side of the shop area last night was Speedhunter Naoto Suenaga's current D1GP Imprezza. Cool little machine, no? And parked directly in front of the shop is this fabulous machine. Those of you who were with us on our opening week will remember Antonio's story about when this car was purchased. We spend a little bit of time playing with this fantastic piece of kit at Ebisu circuit today… Watch out for a story soon.. ish…. Here is another personal car of Kumakubo-san (no wonder the guy is always smiling! )… When ever I see this car I just can't take my eyes off it. More pics to follow! 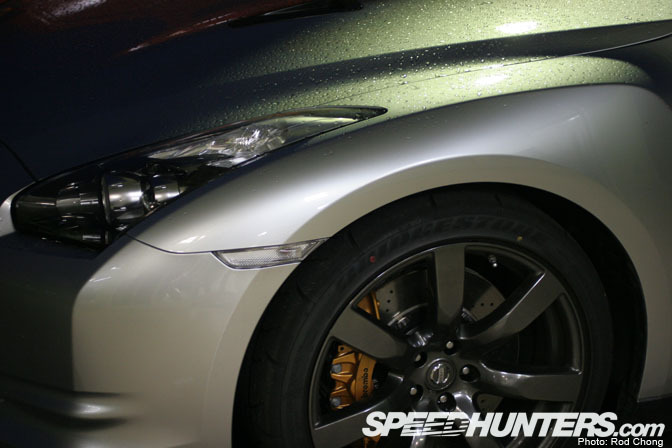 He tends to drive this car every day with the R35 sitting dormant most of the time. One thing I like about this Lexus is that it's a hybrid… a very modern concept for a styled machine. 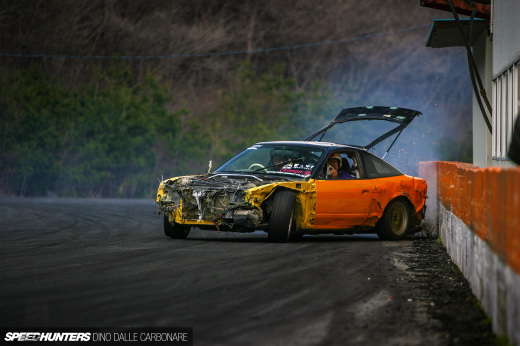 An older Team Orange R33 drift car was getting some love and attention to its engine's blown head gasket. Although previously a D1GP car, it now only does demo duties. Inside the office there is a display of model cars. 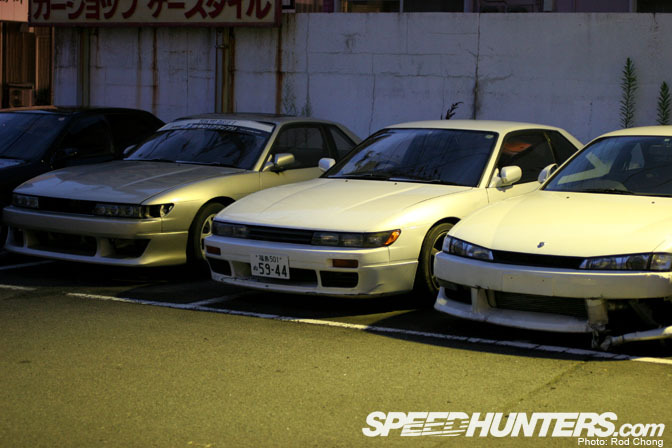 These are recreations of important street drift cars from Kumakubo and his friend's past. I'm sure Antonio could give you a detailed story about each one…. for me, though, it's nice to see these guys celebrate their roots with this set of model cars. 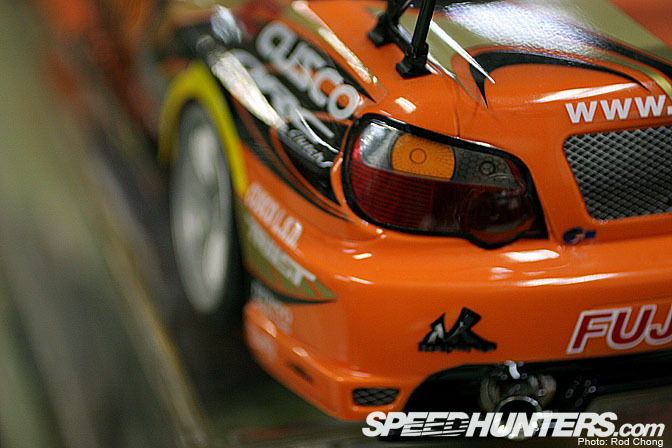 Sitting on top of the model car display is a Team Orange Yokomo drift machine. Doesn't appear to have had any usage, though. Well, it's been an incredible week of diving into the heart and soul of real street drift culture. I have to extend a big 'Arigato!' to our hosts Kumakubo and Naoto Suenaga who have treated us like absolute royalty. What incredibly generous people! Tomorrow we are in transit to Tsukuba City where we'll be stationed for a few days down the road from fellow Speedhunter Mike Garrett. He'll be driving us to a MSC drifting event this Sunday; I am very much looking forward to that one! Really fresh, I have been enjoying the reflective nature of your recent posts- along with the composition- its refreshing to see cars fill the frame and framing play with abstraction. cheers. I'd buy it too! put me up for one! When can se see more pix of that gs? stepsan: more GS pics on the way! LOL Johnathan! Can't believe you said Bourdain! I think he's dope as hell, and I took pics of all the crazy stuff we've (or uhmm... I've) been eating. Horse sushi, beef sashimi, broiled squid on a stick, humongous jumbo fried shrimp... you will get super hungry just looking at my small point n shoot camera. we went to a place with team orange... kumakubo knows i like gyoza so he took us to a spot that has over 400 kinds of gyoza!!!!!!!!!!! dayam!!! but yo.. no DVDs! we'll put it on the site so peeps can watch it free!!! Cool, to think that they have plastic models of their old cars! 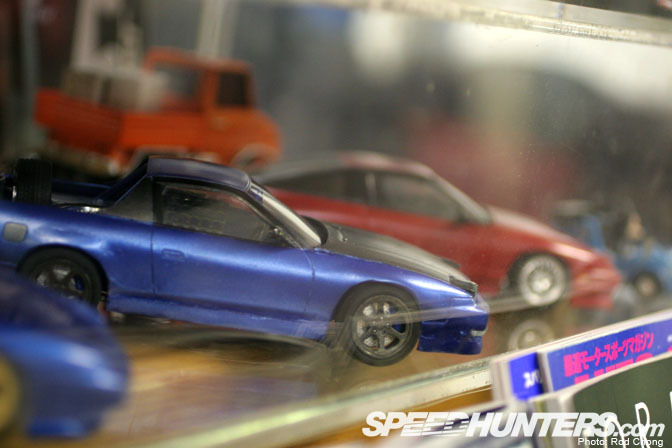 Any more pictures of those model cars?